I love this video about the impact reintroducing a pack of wolves into Yellowstone National Park had on the entire ecosystem of the park. Every time I watch this video I seem to come across a new connection to our work as educators (I know, I’m the coolest, right?). Here are a few of the parallels I’ve seen. What else would you add? 1. A single wolf could not have made the same impact, but a pack (well, three packs according to this info) had an unmistakable impact on the park. You cannot do your work alone, but it doesn’t have to be a huge pack to make an impact that will last far longer than we can imagine. 2. These wolves had no idea about the scale of their impact. They simply did what they knew to do to thrive in their new environment and the rest happened naturally. The work before us as educators doesn’t come effortlessly; for many it is quite natural, but that doesn’t lessen any of the impact. Like the wolves, we cannot see the impact of our work while we are in it. 3. The wolves can’t not have an impact on the park. 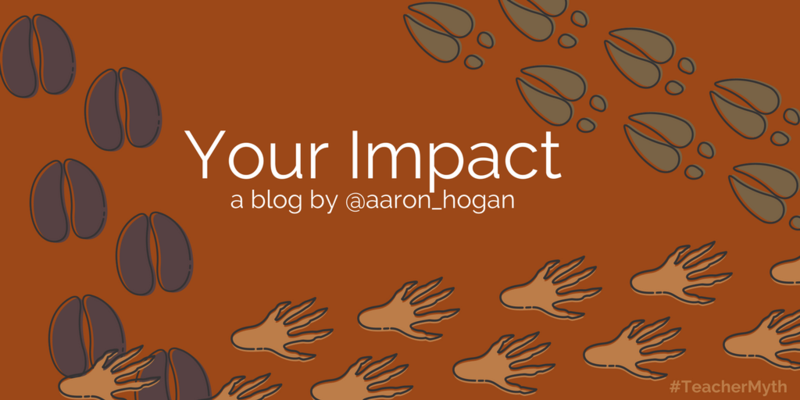 Don’t be fooled into thinking that some of your work makes an impact and other aspects don’t. Every action you take has a ripple. Every choice you make has consequences. Your work makes a difference. Make sure it’s the impact you want to make. So you may wonder to yourself, Why is he sharing these connections between education and wolves in Yellowstone? Because I think we all need this reminder: Great change happens when a group of influencers enter an existing system. My hunch is that we know that, but that at times, we can forget it. Maybe we forget this truth when we get too focused in on the day to day and don’t see the big picture. Maybe forgetfulness sets in while we are right in the middle of trying to deliberately create change on a large scale. In any case, this is true: The school you work in and the students you serve will bear the evidence of your positive influence for years to come. Your work with kids will be remembered for a lifetime. Your actions have a lasting impact. Don’t forget that. If you like what you’re reading here, you might like my book, Shattering the Perfect Teacher Myth: 6 Truths That Will Help You THRIVE as an Educator. The book highlights six truths that will help you THRIVE as an educator, including one–reject isolation–that will challenge you to find a tribe of educators to support you in your work. Get the book on Amazon or read more about the book here.